You may have been using the Original Exclzyme Formulation and just didn't know it. The Exclzyme formulation is the most successful non-animal derived systemic enzyme blend on the market today. It has been commercially available since 1999 and marketed successfully by many other companies under different brand names. As such, it was incorporated into a number of these companies proprietary formulas each using the Exclzyme formulation in different amounts. 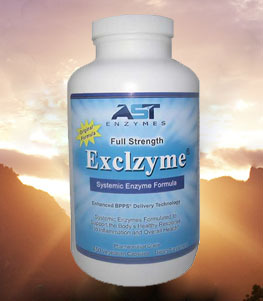 However those days are over: Full Strength Exclzyme - the original 2 capsule serving is here! Protease are enzymes that hydrolyze (break-down) proteins like casein, steak, gelatin, soy, fish and other plant and animal proteins to smaller chains of polypeptides (small proteins) and amino acids for easier uptake throughout the body.